Word came in this evening the Mets have come to an agreement with chubby veteran free-agent catcher Wilson Ramos, a longtime Met nemesis who if he can 1) pass the physical and, 2) stay on the field, and, 3) slow the aging process typical for fat catchers in their 30s, just might improve the Mets’ stagnant backstop situation. It’s only a two-year deal so what’s not to like, especially if it cools Brodie’s jets of entertaining three-way swaps with the Yankees involving Nimmo, Rosario, Conforto or Syndergaard, so it has a mild stamp of approval from us for now. What number will he wear? Ramos is a longtime No. 40 and old enough to dictate it, so I can see Jason Vargas changing his shirt. Vargas in fact has already changed once; you might recall before being thrown in in the idiotic JJ Putz deal of 2008-09, Vargas spent a brief period with the Mets wearing 43. That figure was worn last season by ineffective reliever Jamie Callahan, whose season ended with shoulder surgery. He refused to be outrighted to the new Syracuse club and so became a free agent. This is a long way of saying 43 would be available should Vargas want to switch back. And in the event the Mets actually care what Vargas wants, Ramos could wear No. 4, sadly surrendered by the nontendered Wilmer Flores. Let’s hope Wilmer returns as a coach or something someday. I get that his time was likely up given injuries and a little less production than would behoove an arbitration-eligible ballplayer, but as far as I’m concerned, he doesn’t have to buy a drink among Mets fans for the rest of his life, and that’s something. I didn’t update you all on this but of course 27 will available for Juerys Familia next season. I’m no fan of blowing cash on relief pitchers, but if you’re going to you may as well get a guy whose stuff you know and mostly trust and whom the fans admire. Familia ought to make a good team with Edwin Diaz especially if they’re utilized effectively, but count on the Mets to justify the strenuous Cano trade by carefully designating Diaz as the “9th inning guy.” Not said, if Diaz happens to screw the pooch or tear his UCL as acquired relievers with 100-mph heat have from time to time, it’s good to have a backup. Speaking of reunions the Mets signed Dilson Herrera to a minor league deal. Perhaps if it all goes wrong this year they can trade him to Seattle for Jay Bruce. Let’s get this part out of the way first and say if Robinson Cano wants his old No. 24 back he can go talk to Willie, and if he wants 22 he can talk to Dom Smith. As to Edwin Diaz, the best closer nobody ever heard of wears 39 in Seattle; the same digits belonging last to the presumably departing free agent Jerry Blevins. Now let’s get to the part where I explain why even though this trade could presumably help the Mets get better a lot faster, how I don’t much like it in a matter of taste. As a fan, I don’t want to cheer for a 36-year-old former Yankee steroid cheat, especially one presumably taking over the position of one of the only guys on the club I was excited to see playing every day next year in Jeff McNeil. Yeah I know there’s still much detail to work out, there’s always a role for a good bat, guys get hurt, Frazier could still be traded, and so on, but I don’t have to like it that McNeil looks like the first victim here. As for Edwin Diaz, well, he’s a relief pitcher, relief pitchers are unpredictable and erratic by nature, and I strongly believe the way to get them is to make them (Jeurys Familia) and not not buy them, even if and when they are cheap and controllable. When they’re cheap and controllable is when you trade them. Even a washed-up bullpenner like Jerry DiPoto (a former Met 45, doncha know) knows that! So those are the new guys, we cough up capable-but-expendable Jay Bruce, who was a kind of bad-penny Met whom they never really wanted but kept going out and getting; the alleged best return of the Addison Reed trade booty in Gerson Bautista (watch him blossom into Seattle’s next closer); last year’s top draft pick, Jerred Kelenic, who if nothing else seemed like a hitter, and Anothy Swarzak, aka Exhibit A in the don’t-go-get-relievers-based-on-one-season-of-goodness department. Swarzak will presumably bounce in Seattle back too, then go at the summer deadline, probably to a win-now dreamer, like the Mets. And if he doesn’t rebound, then he’ll be out of a job. Maybe the principals mentioned above will change, but if you needed evidence the Mets were back in control of Omar “Big Splash” Minaya there you have it. Move heaven and earth for 60 innings of relief and a veteran with “talent.” Yuck. The question is, what’s next? Well if they’re truly serious about contending let’s see them really strap one on, go sign Bryce Harper, keep Syndergaard, sign Nathan Eovaldi and trade Steven Matz for that catcher instead. What are you, scared? If this didn’t do it, what will? 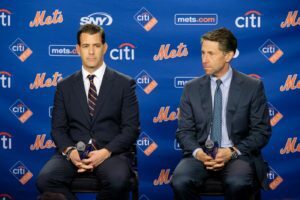 From where I sit, hiring the least experienced candidate they possibly could and putting Omar Minaya a heartbeat away is a mixed message at best for our Mets. We know Omar for all his scouting smarts is an analytical illiterate and closely aligned with Fred Wilpon, typically the root of all dysfunction that accompanies the club including this last coup. Meanwhile it looks as though the ties to the maligned Alderson Administration are to be cut completely, with John Ricco and JP Ricciardi evidently afterthoughts. As for Brodie, who the hell knows. Putting aside the awkwardness of now lording over talent he once represented in opposition to the brass and the accompanying conflicts-of-interest that entails, it’s hard to guess how he’ll actually address the club’s weaknesses. Though this smells a lot like the first Omar Takeover, where the club will let go of their typically tight grip on salaries so as to make a show of their new willingness to compete, probably by doing something moronic like signing the most expensive relief pitcher out there, or maybe by tearing apart the farm system built by predecessors in a daring trade. So I’m predicting a newsy offseason likely to result in a few inarguable “on-paper” improvements but I’m going to wait and see whether they actually represent the mix of creativity, boldness and strategic forethought that actual successful organizations employ. It’s not going to be easy even for a smart group. Were it up me, I’d see what it would take to make Manny Machado the third baseman, which would come with the bonus of forcing Todd Frazier to another club. The Mets may also have a decision to make on the order of Duda-Davis, choosing between the promising but thus-far inconsistent Dom Smith and the promising but older and less-sound defensive player Peter Alonso, which is not as easy as it might look, as both guys could tank. First basemen need to hit. My secret weapon? See what it takes to get one more really good starting pitcher in the style of the 90s Braves adding Greg Maddux to the Glavine-Smoltz-Avery core. If it turns Steven Matz into trade bait, or the lefthanded reliever we apparently need, so much the better. You can count on the Mets making a show of acquiring relief pitchers anyhow, as dubious a strategy as I suspect it is (the way to prevent losing close games is to score more runs, and not necessarily count on the other team to fail at the same), but were they to acquire Brooklyn’s own Adam Ottavino to bolster what they’ve got I won’t mind, and if you’re going to select a “proven closer” it may as well be Jeurys Familia. Roster moves thus far are marking the end of the line for Phillip Evans (28); Rafael Montero (50); Jack Reinheimer (72); and Jamie Callahan (43). Major league free agents are Jerry Blevins (39); AJ Ramos (44); Jose Lobaton (59); Devin Mesoraco (29); Jose Reyes (7) and Austin Jackson (16). I could see Jackson back as a reserve outfielder if nothing else, and I figure they might consider Mesoraco and Ramos. Props to Mark Healey for the headline/nickname which I’m totally adopting.